To bring greater transparency and efficiency to the IPO process, Nasdaq has created the IPO Indicator* for use by all market participants. This unique tool, exclusive to Nasdaq and its member firms, allows member firms to see detail for all of their orders for an IPO during the pre-IPO quoting period. The IPO Indicator also shows the amount of shares that would execute for every order if the cross were to occur at that Indicative price and time. Underwriters and participants will now have access to more information to make better, more informed and more efficient trading decisions during the pre-IPO period. The IPO indicator is a web-based tool that gives market participants access to the order price levels they have entered and the potential of fill for each order. These execution share counts and percentages are based on the current indicative price on the NOII and current time, as the IPO Indicator matches information from NOII and the user’s firm or MPID orders during the pre-IPO period. This data is enhanced by an execution summary table at the top of the application for a consolidated look for quick reference. 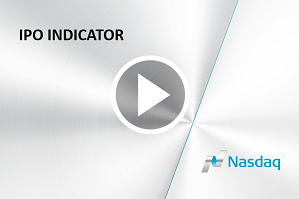 The Nasdaq Workstation contains Level 2 quote data, access to ACT, and many valuable tools in addition to the newly introduced IPO Indicator. Visit the Nasdaq Workstation for a more in depth look at the functionality . The IPO Indicator can be accessed via the Nasdaq Workstation free of charge or via the new IPO Workstation, focused on providing best in class data for our IPO market participants and underwriting community. The IPO Workstation is free of charge through June 2015, and will be updated frequently with additional tools and data to continue bring best in class technology and services to support our clients as they participate in the Nasdaq IPOs.